on 09 March 2018 . 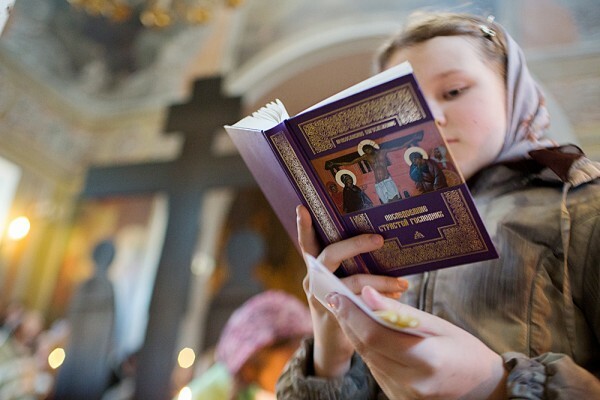 A reference point in the typiko of Great Lent is the communion of the Presanctified Precious Gifts. The discordance between the festal and joyful nature of the celebration of the Divine Eucharist and the compunction of Great Lent makes it inappropriate to celebrate the bloodless sacrifice on fast days. And yet, the importance of Holy Communion for the spiritual struggle of the faithful has established participation in the Presanctified Gifts even on such days. The difference between the Presanctified Liturgy and the more common types of the Eucharist is that the Precious Gifts have already been sanctified as Body and Blood earlier, at the Divine Liturgy on the previous Saturday or Sunday. At the proskomidi, the celebrant takes out a second lamb [central portion of the loaf], which he places with the first on the paten. He sanctifies and elevates this as normal, and, after pouring the warm water into the chalice, immerses the second lamb in the precious blood and places it carefully in a special artoforio or tabernacle [a vessel kept on the holy alter where the reserved gifts are kept] until the day when the Presanctified is to take place. on 18 February 2018 . To avoid turning Lent into hard and senseless weeks of diet, one should keep several simple rules. The aim of a fast is to bend our body to our soul (to restore the right hierarchy of soul and body), to multiply love, to sharpen attention to our spiritual life, to train our will and gain our powers for spiritual fight. The temptation to fall into despair is strong. “How can I live without tasty food? No more entertainments! How long the services are!” In fact, there is no reason for despair. Long services are at the same time the examples of middle-aged spiritual poetry, philosophical reflections on the human’s place in eternity, feeling of unity with other people praying in the church as well as communion with God. Often we can face the other side of the Lenten despair: “I cannot fast according to the statue. I miss services. I get distracted by secular vanity.” Remember that God needs our heart, not our legs or stomach. He sees in a soul the desire to serve Him, and He sees the weaknesses, too. This constant recollection about God will become our constant joy about Him. on 27 January 2018 . Meeting at Larnaca airport and necessary instructions will be given - departure for Tel-Aviv. Arrival and transportation to the Hotel in Bethlehem. After breakfast, departure for a day journey to Tiberious lake or lake Galilee. We will first visit the well of Jacob (dialogue of Christ with the Samaritan girl), Visit to the Jordan River where the service of the blessings of water will take place - symbolic baptism of pilgrims. The Orthodox monastery of Tabor Mountain where the Trasfiguration of Christ took place, the Church of Cana (the first miracle of Christ), Nazareth (the church of annunciation). Return to hotel. Dinner.